Managing your career takes time and careful planning. A career plan will help you reach your care goals. Preparing a current resume is an important part of launching your career plan. Where are these careers available (cities and states)? Is there a particular organization you are interested in working for? These are questions you should answer… even if you aren’t currently in the market for a new job, as they will help you to clarify your work-related objectives and identify the elements that may influence your level of job satisfaction. Utilize the worksheet (.doc) to create your career path and treat your completed worksheet as a guide to keeping your work in sync with your skills, interests, values and preferences. Treat your completed worksheet as a guide to keeping your work in sync with your skills, interests, values and preferences. Assess Yourself – Self Assessments can help you know yourself better, which can help you choose a satisfying job or occupational field to explore. Personality Test – A Personality Test can give you a fairly accurate description of who you are and why you do things the way you do. 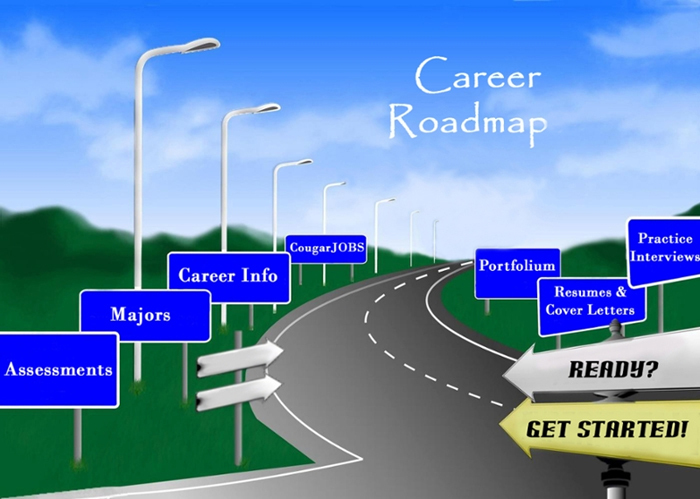 The Career Center is proud to introduce the Career Roadmap, an all-access online resource comprised of new career development technologies. The CRM is designed to help students navigate their career path with a comprehensive online suite of career tolls and resources. The Career Center’s job is to jumpstart your career plan. Here’s a nifty way to start. STOP 2: What Can I Do With This Major?